I was just having a conversation last night with a godly woman. Telling her that, especially this week, after making important decisions, I’m struggling a bit with wondering…worrying…about ‘a tomorrow’. This mornings devotional was spot on! This is from “Jesus Calling” by Sarah Young. I started doing this devotional after I got it for Christmas this past year. Every.single.day it speaks to me. I’m always amazed at how God chooses to speak…even tho I shouldn’t be surprised, I mean I did specifically ask Him to before I opened the Word! I’m finding truth in the words about worry being an “oppressive burden”. 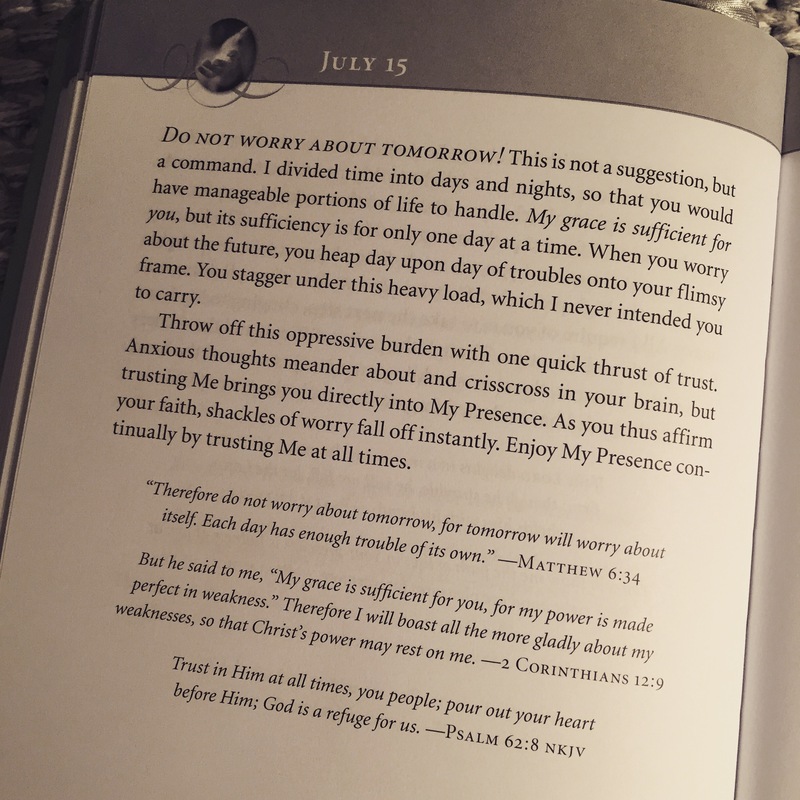 Worry about tomorrow, worry about if this decision or that decision is the right decision, worry about future things, worry about what others will think of me or how they perceive my actions and thoughts, worry worry worry. It is an oppressive burden that we are not meant to carry. That is so true for what I have struggled with in the recent past. “Weighing heavily on the mind” and “causing depression or discomfort”. I had worried so much about this particular situation that I was sick to my stomach, I had headaches, I cried deep, soul-wrenching tears, I even sobbed in my sleep. I wasn’t fully trusting the Lord with it. I THOUGHT I was. But I wasn’t. I have learned, no, I AM learning how to trust Him. He has a plan for me. He WILL work it to His glory…and that’s really what it’s all about. Is He being glorified or embarrassed by what I’m doing, saying? Am I letting Him handle the next step? Am I trusting Him for tomorrow? Next month? Six months from now? This entry was posted in Uncategorized by palmtreejen. Bookmark the permalink.